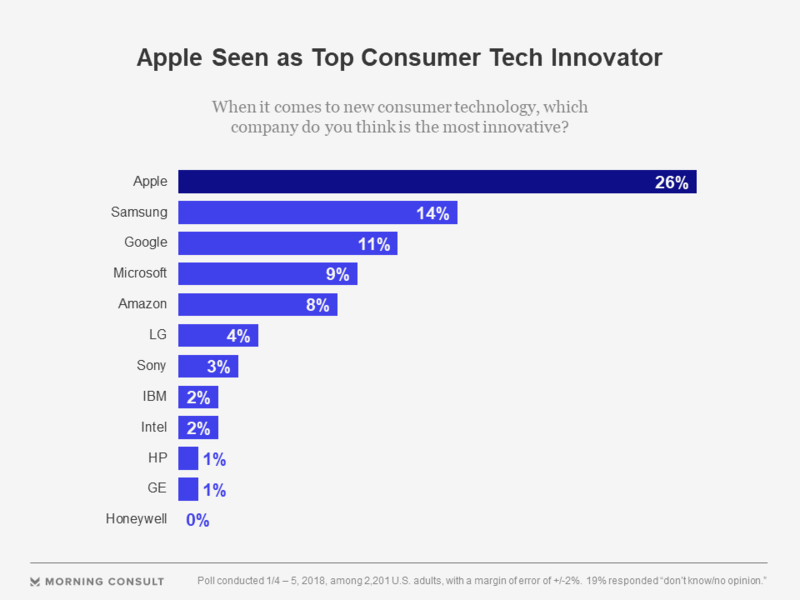 When U.S. adults were asked which consumer technology company is the most innovative, Apple Inc. was the clear winner among a list of 12 businesses, chosen by 26 percent of the 2,201 participants in a recent Morning Consult survey. Samsung Electronics Co. came in second, at 14 percent. The top five were rounded out by Google Inc. (11 percent), Microsoft Corp. (9 percent) and Amazon.com Inc. (8 percent). At the bottom of the list was Honeywell International Inc., which sells smart home gadgets such as wifi thermostats, with zero percent. The poll, conducted Jan. 4-5, has a margin of error of plus or minus 2 percentage points. Sei is the editor in chief at Morning Consult.